So today is the fifteenth, a month out from Valentines Day and the time I've deemed it acceptable to start filling my house with pink and red. Whatever your feeling is towards Valentine's Day, and the stupid pressure placed on the actual day, don't you agree it is a great time to fill your home with color and forget about the freezing temperatures outside? It is something happy to focus on, at least it is for me, a person who lists pink and red towards the top of their novel length list of favorite colors. Back to the "cold hands, warm heart" statement; whoever started that saying must have been crazy. Cold hands and feet are the first thing that ruins any kind of winter fun for me. I have a few distinct memories of being miserable in the snow and the most vivid feeling I have about those memories are my feet and hands, so cold they feel like they're burning. I think those occurrences happened one too many times, because at this point I wouldn't say I like to play in the snow. I think it is beautiful as long as I can stay inside and look at it, but I don't want to build anything out of it, walk, or drive through it. Maybe this little DIY will make me change my mind. A few years ago, a family friend made those rice filled, heat bags for Christmas. If you're unfamiliar with them, you dampen the cloth bag that is filled with rice and place it in the microwave for a minute. The bag provides a nice, moist, heat to help aches and pains, or in my case, warmth to a perpetually cold body. The rice inside holds the heat for a surprisingly long time and the weight of the bag is such a nice comfort. I thought that a smaller version of the heat bags would be great for pocket warmers, and considering the holiday approaching I decided to make them heart shaped. I'm spoiled, and use a sewing machine for things like this, but it isn't a project so large that you couldn't hand sew if you choose to. If you are hand sewing, make sure your stitches are small enough that your rice will stay put inside the bag. Layer two pieces of fabric, and cut out a heart shape. Your heart should be about palm sized, perfect size to fit in your pocket. If you choose to, use your pinking shears to trim the edges of your hearts. 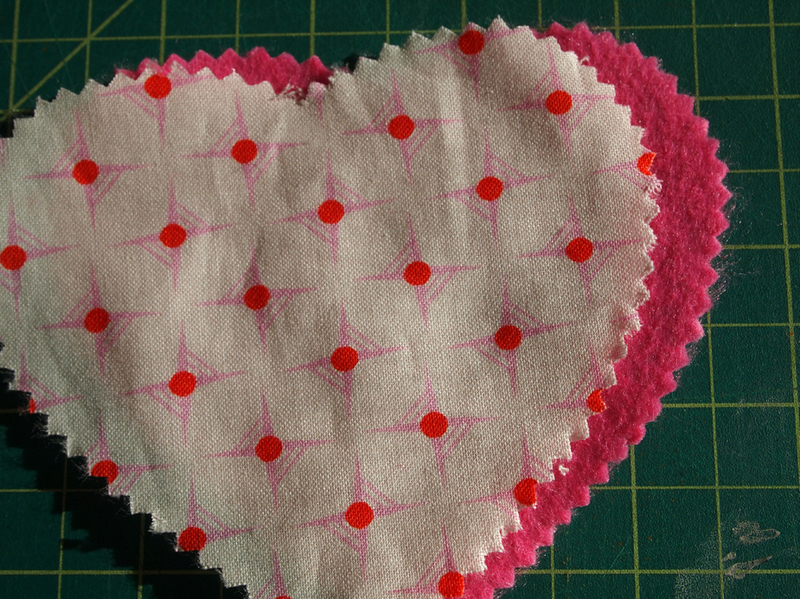 Start sewing around the edge of both of your hearts, right sides facing out, 1/4"-1/2" from the edge. Stop sewing an inch from your starting point, leaving a gap to pour rice inside of the heart. Use a funnel to fill the heart with rice. Do not overfill the heart, the rice inside should be able to move around and you should be able to sew the opening closed without any trouble. After you sew the heart closed, snip the excess strings. You have a finished hand warmer! To use the hand warmers, spritz with water, and heat in the microwave for 15-30 seconds. Put the hand warmers in your pocket on the way out the door and enjoy your non-icicle fingers. Your hand warmers will stay warm for about 20 minutes, and can be reused and reheated over and over.